The left upper lobectomy is probably one of the most difficult to perform by uniportal approach because of the variable vascular anatomy and, sometime, the unfavourable angle to insert staplers. 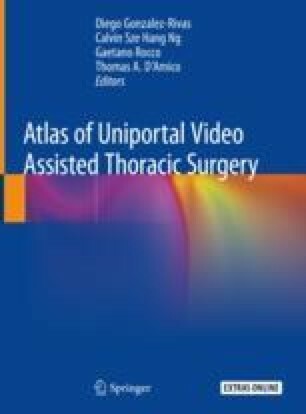 In this chapter we aim to provide a simple guidance on how to safely perform a uniportal left upper lobectomy sharing few tips and tricks. The online version of this chapter ( https://doi.org/10.1007/978-981-13-2604-2_23) contains supplementary material, which is available to authorized users. Nadal SB, Munoz CG, De Jesus Venegas JJ, Mafe J. Uniportal left upper lobectomy with totally incomplete fissure. CTSnet video article: https://www.ctsnet.org/article/uniportal-left-upper-lobectomy-totally-incomplete-fissure.